Teach 600 people to eat more vegetables and less added sugar for a year, and it turns out they will lose weight. There's nothing super shocking in the new DIETFITS study, but there's a lot to learn about what doesn't matter in dieting. People's insulin response (how much insulin their body releases in response to a dose of sugar) did not predict which diet they would do better on. Three DNA variations that were supposed to predict your success... also meant nothing. The study itself is paywalled, but Examine.com has a free breakdown of the study's design and results. It's the kind of study that other diet studies wish they were. It's pretty big — 300 people per group. It's a randomised controlled trial, which means people were told which diet to do. The investigators used more reliable methods than just asking people what they ate. They also focused on getting solid answers to a few important questions they identified ahead of time — yielding the results in the bullet points above — rather than asking a million questions and fishing for blips in the data. The low-fat dieters were told to reduce their fat intake to 20g per day. That's what's in four teaspoons of olive oil, or three-quarters of an avocado. A single McDonald's double cheeseburger would put you way over the limit. The low-carb dieters were told to reduce their carbs to 20g, as well. That puts you into ketogenic territory, where your body alters its metabolism to supposedly become a fat burning machine. For comparison, half a cup of rice has 22g of carbs. Those assigned to Healthy Low-Fat were instructed to choose whole-grain foods (e.g., rather than whole wheat flour products), including steel cut oats, farro, barley, quinoa, brown rice, and wild rice. Healthy Low-Fat participants were also encouraged to explore and consume a wide range of legumes and beans, fresh fruit, low-fat dairy products, and lean meats. Those assigned to Healthy Low-Carb were instructed to choose high quality oils and fats, avocados, hard cheeses, nut butters and nuts & seeds. During the Titrate phase [after the initial 8 weeks], and throughout the remainder of the 12-month protocol, as the Healthy Low-Fat group added small amounts of fat back to the diet, and as the Healthy Low-Carb group added small amounts of carbohydrate back to the diet, they were instructed to do so with these same quality foods. Given that high quality foods can be more expensive than foods that are similar in type but lower in quality, the encouragement to choose quality was framed as a continuum as opposed to an either/or (e.g., for the Healthy Low-Fat participants, organic wheat berries was at the highest level of quality, followed by conventional wheat berries, then whole wheat bread made with a minimal number of ingredients and no additives, then a more conventional whole wheat bread with many ingredients including additives and finally, refined white flour bread with many ingredients and additives was considered the lowest end of the quality continuum). 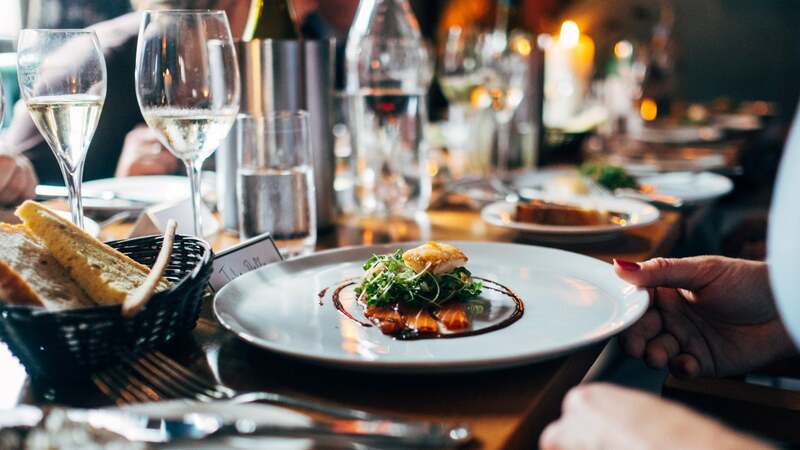 In other words, participants were encouraged to choose the highest quality foods that they could reasonably find, realistically afford and enjoy. Most people didn't actually achieve the 20g goal. The low-carb dieters averaged 96.6g of carbs at the end of the eight weeks, and increased that to 132g by the end of the year. The low fat dieters managed 42g of fat at the end of the first stage and were eating 57g per day by the end of the year. But even though they didn't quite hit their targets, most people lost weight, whatever group they were in. The averages for both groups were around lost 5.4 to 5.9kg for the year, but there was a lot of individual variation! The examine.com folks put this graph together showing the results. In each group, a few people lost more than 25kg and a good chunk of the participants didn't lose weight at all, or even gained up to 10kg. This study doesn't bring us any closer to knowing why some people respond better than others to the diet. And since each person only tried one of the diets, we don't know whether the people who gained weight on one diet would have done better on the other. The researchers were hoping that genetics would reveal the answer. Three genes, PPARG, ADRB2 and FABP2, were identified in previous studies as being possibly related to whether people would do better on one diet or the other. So they looked at the SNPs, or gene variants, known as rs1801282, rs1042714, and rs1799883. If a person had the versions of all three that have previously been associated with low fat diet success, and they ended up on the low fat diet, they were considered to have genes that "matched" that diet. Same with the low carbers. Anybody whose genes were a mix of low-fat and low-carb favouring genes was considered mismatched to their diet. Sadly, this didn't work out at all. The lead researcher told STAT: "We were so excited and thought this would work," but after viewing the results, had to admit: "We didn't even come close." Insulin secretion also didn't predict success on one diet or the other. When you eat food, and especially carbs, your pancreas squirts insulin into your blood as a signal for other cells to absorb the rush of nutrients. People with diabetes either don't make enough insulin (type 1), or their fat and muscle cells don't respond to the insulin (type 2). So they tested what happens to a person's insulin levels 30 minutes after they drank a massive dose of sugar. Since type 2 diabetes is associated with obesity, the researchers wanted to test the theory that people who overproduce insulin will do better on a low-carb diet that doesn't trigger as much insulin production. But this didn't pan out either. First, this study was done in a specific population of people, so we don't know if the results apply to everyone. Participants lived in the Stanford and San Francisco Bay areas of California. They tended to be fairly well educated and typically had enough money to easily afford healthy food. Both diets involved a focus on eating lots of veggies and less sugar, but this study doesn't prove whether that's enough; it might be that you also need a nutrient to minimise. I would have loved to see a control group that wasn't given a goal to lower carbs or fat, but just given the baseline advice about a high quality diet. And ultimately, we don't really know why some people lost 25kg and others gained more than 9kg. The researchers are planning more analyses to look for more answers. So far, though, our best guess is that if you flip a coin your chances are probably just as good on a low-fat diet as a low-carb one. Thank you for this summary Beth. This is an excellent piece of journalism and just the kind of thing that keeps me coming back to Lifehacker. Interesting research!! One thing though - from what I've read LCHF diets recommend limiting carbs to 20-40 grams carb per day. "low-carb dieters averaged 96.6g of carbs at the end of the eight weeks, and increased that to 132g by the end of the year"
Based on the low carbers eating nearly 3-4 times more carbs than what is recommended for a low carb diet, can the trial diet really be called low carb? All in all a very interesting study, and i think the key message is - stop eating refined crap and enjoy real foods. It's an interesting study and thanks for reporting. I find it hard to take the results seriously at a first glance as the low-carb group was meant to have 20g of carbs a day and hit 96g tapering to 126g a day. Neither of which are low carb or would cause ketosis. it would've been good to see the results of weight loss to g eaten in the low carb group but Will have to read the examine/ study further. The study didn't care whether they hit the goal or not. The point was to set a target as either HLF or HLC and see what people achieved, and whether it helped them lose weight. The study supports the general knowledge that the type of diet is unimportant in weight loss. Disagree with that being general knowledge, also goes against what i have researched, personally observed and observed in others. but hopefully with the release of their data additional information will be visible into what the people who go close to the target achieved vs those who didn't stick. So you disagree with the notion that eating at a calorie deficit will cause you to lose weight? 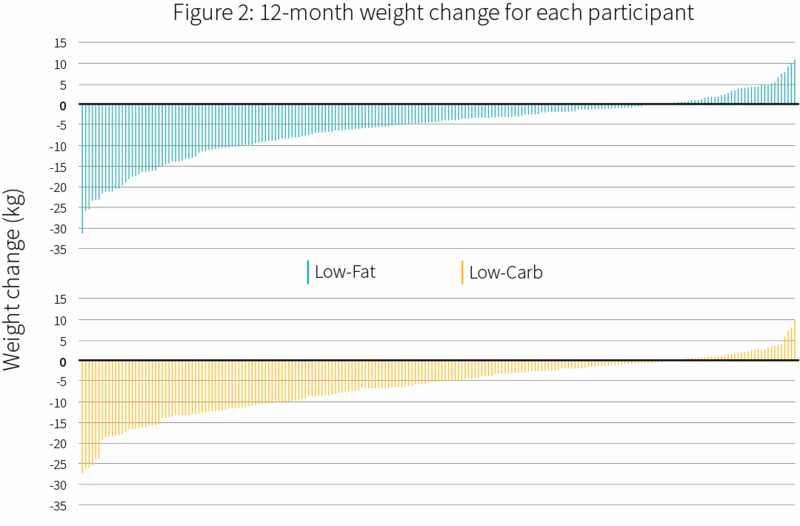 Looking at the free data, it shows that the average participant across both groups reported dropping their intake from ~2200kcal, (~9200kj) down to ~1500kcal(~6300kj) after three months, which tapered off to ~1750kcal(~7350kj) after 12 months. My assumption looking at the graph is that the average across the year is 1600kcal or 6700kj. A kilogram of bodyfat contains ~37,000kj. So assuming the average TDEE was 9200kj, and the average deficit was 2500kj, the average weight loss per person should be 1 kilogram every 14.8 days. This leads me to believe the majority of participants were under reporting their calorie intake, most likely due to a failure to appreciate what they were eating. Most people should have lost 10+kg on those sort of numbers, because people in the 40 BMI range generally have a higher TDEE than 9200kj. In fact, on the numbers listed, almost every participant should be up near the high end of the scale for weight lost, because a 2500 kj deficit per day equates to 912,500kj over the year, divided by 37,000kj per kilogram of fat: 24.66 kg of fat lost over the year.